Stronger at 2! More powerful... more influential... more creative... more innovative! As yours truly Runner Rocky celebrated my second year of running in the running community as an athlete last June and as this blog celebrates its second year anniversary in the world wide web as an influential blog this coming November, it's now time to give you a double treat! 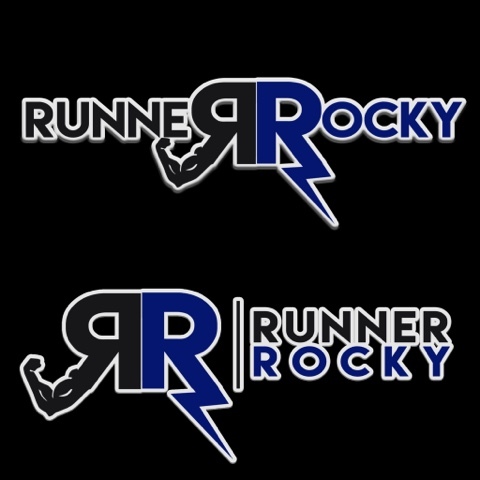 Ladies and gentlemen, meet the new logo and icon of Runner Rocky! Double "R" in black and blue! What does this symbol really means?! Well at first glance, the "Double R" means "Runner" and "Rocky" which comprised Runner Rocky, my title as an athlete/runner and of course, the name of this blog. But looking closely at the two Rs depict a deeper meaning! The "Double R" in the 2016 new logo / icon of Runner Rocky means "Strength" and "Speed." Hence the first "R" in black symbolizes a muscle for Strength or FITNESS and the other "R" forms a lightning depicting Speed for RUNNING or MARATHONS - putting them together forms a sporty logo now depicting SPORTS, FITNESS, and MARATHONS which is the main theme / topic of this blog site! The first one is the format where the double "R" icon is separated from the title while the second one is in a banner format which is used in the header of this blog. The banner explains how the reversible double "R" was derived. Now it's already clear the real meaning of this reversible double "R!" Meanwhile black and blue are the color themes of this new logo making it stronger, more powerful, and more influential not only in conquering a particular race or leading in the world wide web but also in surpassing the different challenges! For the third time around, this new logo of Runner Rocky is designed and created by my bestfriend Romeo "Miyo" Briones Jr. Yeah just like me, he is also a Software QA Engineer and a blogger! He's blog mainly focus on food and travels. You may check out his cool blog at Take Off Philippines and enjoy a daily dose of ergasmic occurrences! Great job for this! "Double R" = "Strength and Speed" = "Runner Rocky" = "Blogger + Runner"